Here's V-Tech's stylish cordless phone, and you can almost hear its designers wondering why cellphones get to have all the fun. 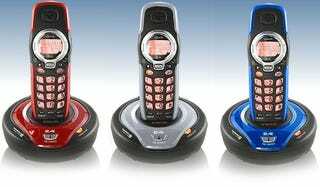 Take your pick of silver, blue, and red interchangeable face plates and base plates, and add in polyphonic ring tones and a flashing visual ringer and you end up with a sprightly design for a cheap land line 2.4GHz cordless. Not bad for $31.